For my anniversary with Mrs. Portlandeater, I decided it would be nice to go out somewhere special. When my wife suggested Fore Street, I thought that was a great idea. I’d heard so much about the award-winning Portland institution – in 2002, Fore Street was #16 in Gourmet Magazine’s Top 50 Restaurants of the U.S. and in 2004, chef-partner Sam Hayward was named Best Chef in the Northeast by the James Beard Foundation. Seeing as I heard it was a pricey meal, it wasn’t someplace I planned on going just for a casual night out – even with all their accolades. This would be a perfect time to try it though. Fore Street opened in 1996 and is known for their ever-changing menu based on what is fresh or in-season. They work hard to obtain local food and keep it as close to the source as possible. This means they have lots of Maine-grown, organic foods which come in and are cooked on the same day. It also means they don’t post a menu online except to note a couple items that are always on the menu. They may also run out of some items before you show up for your meal. We arrived around 8:00 for an 8:30 reservation thinking we’d have a drink before being seated. However, as luck would have it, our table was ready right away. We were led to a seat right by the window which looked across a parking lot to the far end of Commercial St. It was probably the best seat in the house. I’m not bragging, but it was pretty posh. I was considering auctioning off the spot, but I decided against it, choosing instead to enjoy the view and secretly laughing at the suckers who had to sit in the middle of the restaurant. Our menus were delivered immediately and we were poured water. My wife ordered a glass of wine and we had some time to review the options. The front of the menu displayed all the starters. There we’re a lot of them – various salads, seafood, and meat dishes. The back of the menu listed entrees and sides. There were more meats and seafood along with some vegetarian options. With so many choices and it being my first time there, I was slow to make a decision. After considering salads and various seafood options, l picked the Wood Oven Roasted Mussels, a Bang’s Island specialty, for a starter. My wife went for the Nectarine and Marinated Cucumber Salad which breaks my Fundamental Food Rule #17 that a salad must never contain fruit unless it is a fruit salad. The main dishes looked great. I was leaning toward seafood, but because my app was seafood I finally settled on the Marinated Half Chicken. She ordered the Atlantic Summer Flounder Filet. We ordered two sides to share – Garlic Mashed Organic Maine Potatoes and Broccolini with Grilled Red Onion and Roasted Garlic Butter. While waiting for our food, we had some time to take in the scenery. The place was packed on a Saturday, both at the bar and in the restaurant. The open kitchen had a see-through walk-in refrigerator which housed fresh food. The cooks were hard at work, working a wood-burning oven, grill, and turnspit with three or so chickens skewered onto it. The atmosphere was casually elegant. The lighting was on the darker side. The staff was jovial and attentive – we were delivered a significant amount of bread and my water was promptly filled each of the many times it was emptied by my dehydrated pie-hole. The first items showed up in reasonable time. 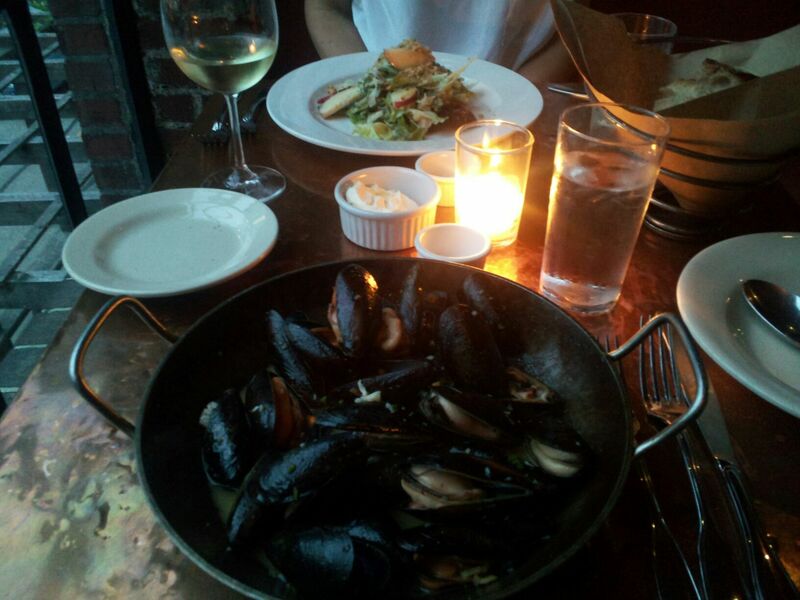 Both salad and mussels looked delicious and my dish smelled like the fruit of the gods. My pan was a giant serving of the delicious mollusks served in almond butter. My wife said her salad was divine. I really liked the fact that once I was done with the mussels, I had the opportunity to finish the almonds which were sitting in the delectable butter sauce. After finishing, we had a little time before our main courses arrived. My wife’s flounder was also delicious. It was served with fairy ring mushrooms, beet greens, pistachio butter, and white wine sauce. The sides were superb. The broccolini and mashed potatoes – two of my favorites anyway – were cooked to perfection. The broccolini was left crunchy and colorful with a good garlic flavor. Adding to my theory that there can be too much garlic on breath but not on food, the potatoes had serious garlic taste and just the right amount of additional seasoning. After finishing our magnificent rations, we were very full. The huge portion of mussels and the half chicken actually left me feeling like I ate an entire live chicken that was trying to work its way out of me. We passed on desert. We wanted to indulge, but it would have put us over the edge to the point that they would have to roll us out of the establishment. There was no doubt the meal made us happy. I was thrilled with the portion size. It wasn’t a cheap night at $140 after tip for two people but the meal did include two apps, two entrees, two sides, and a drink. For a special night it was worth it. I’d recommend Fore Street for those times when you’re looking to impress. They’ll provide an excellent meal, but it would probably be too pricey for the average person to visit on a regular basis. Give it a shot and add it to your special occasion list. And make your reservations early because they get booked really quickly. This entry was posted in Portland, ME food on June 29, 2013 by peterpeterportlandeater. In June, – this month, for those of you too lazy to refer to your calendar – the city of Portland began posting health inspection reports online for the public to see. This change came after a number of changes in the health inspection code. Anyone who follows the local restaurant scene probably suspected changes were needed after three waterfront businesses were shut down last year due to rat infestation. The three businesses – the Porthole, Comedy Connection, and Harbor’s Edge Banquet Hall shared a kitchen and food license. All three were reopened within a few days after a re-inspection. The Comedy Connection closed for good shortly after, and while probably for a variety of reasons, it’s safe to say that the initial shut-down was at least partly to blame. The changes made by the city have made them more in line with state health code, modernizing and streamlining the city code. There are now penalties for failing inspection all the way up to shut-down for multiple consecutive failures. Additionally, they are increasing the number of health inspectors from one to three. With a city that has hundreds of restaurants in need of inspection every two years, it only makes sense to have more than one inspector. Add in the need to reevaluate failing establishments to make sure they’ve corrected their issues, and we’re talking about way more work than one person can handle. In a city with a major restaurant scene and a reliance on tourism, this is a critical change to assure restaurant-goers they can have faith in Portland eateries. It’s important to note that a health inspection failure isn’t necessarily a sign of a bad restaurant, but more of a wake-up call to correct issues that could potentially cause problems. You might also consider that a failure and then a subsequent pass of an inspection shows that the restaurant actually cares about making it right while a restaurant that hasn’t been inspected recently could have more violations without anyone knowing it. A restaurant with multiple consecutive failures would definitely be cause for alarm to me and shows a lack of concern for the customer and their safety. Years ago, I worked in the food industry and was around for health inspections which we never failed to my knowledge. Nor did we work exceptionally hard to pass. We just completed nightly cleanings and made sure to clean everything else semi-regularly. Refrigerators, shelves, fan filters, etc. got cleaned on slow afternoons. Food safety was never specifically addressed verbally, but management led by example and we followed their lead. Health inspections are easily passed, but it takes a culture of following the rules and education. Some people may not think food safety is a serious issue, but it is. Lack of food safety, such as cross contamination, poor sanitation practices, and improper food temperatures can cause sickness – and in cases of someone with a weakened immune system – even death. The seriousness of this is displayed in the list of reports on the City of Portland website where a complaint was filed because someone became sick after a meal and then an inspection immediately following resulted in a failure. While it’s sometimes hard to know for sure why someone became sick, it raises a red flag, particularly if multiple people became sick after eating the same food. At the same time, you should also know that just because a complaint was filed doesn’t mean it was legitimate. So what should you make of all this? Am I trying to say that you shouldn’t go out to eat in Portland? Not at all. In fact, you can feel more confident now that someone is actually checking to make sure you’re going to be safe. It’s certainly not a guarantee, but you can also do a little research on your own before you choose a place to eat. Did that restaurant pass the last health inspection they had? If they failed did they pass the follow-up? Have they been inspected at all recently? You can now go out armed with more information. I know I’ll be checking before I go to eat. Peterpeterportlandeater will continue to eat at Portland’s fine and not-so-fine establishments. The city is working hard to improve the way they monitor restaurants. Now you can see for yourself which ones are concerned about what their customers are eating and which ones have raw beef blood dripping in your Caesar’s Salad. I want to visit ones that care about what their patrons are eating. Anyway, isn’t that really their job in the first place? This entry was posted in Portland, ME food on June 25, 2013 by peterpeterportlandeater. It’s been a busy couple of months away as Peterpeterportlandeater Enterprises shut down and took some time off to relocate specifically so the team could bring you more Portland culinary quirkiness. It was a lot of work, but while prepping for a physical move, I was always contemplating my next food move. So like the crazy uncle you didn’t realize was missing, I’m back to drop some knowledge on you food-style. We decided to visit The Corner Room Italian Kitchen and Bar – affectionately known as The Corner Room to those who like to be able to say their restaurants in one breath. Owned by chef/restaurateur Harding Lee Smith, The Corner Room is one of three sister restaurants along with The Front Room and The Grill Room. Also opening this month, if it hasn’t already, is a new seafood “room” on Custom House Wharf – the fourth member of the family. Looking for brunch on a Sunday morning, we visited the Exchange and Federal St. location when there wasn’t too much of a crowd, though the Old Port was starting to pick up pace. After a friendly greeting from a couple of employees at the front of the house, we stated that we had reservations and were promptly seated. We had a minute or two to observe the beautiful woodwork in the restaurant and were delivered our menus. The main menu provided a solid combination of breakfast and lunch items including apps, breakfast plates, pizza, pasta, and paninis and a separate sheet gave a bunch of meat and cheese selections. We also got a brunch drink menu, but we weren’t planning on drinking on this Sunday morning. After a moment of looking at our menus, the waitress came back and asked if we would be interested in hearing the specials. We were and she read them to us. There were more specials than I’ve ever heard at a restaurant. I like specials, but it was almost hard to keep track of. Nonetheless, I planned on ordering off the menu after I heard them as none peaked my interest. I was dead set on ordering breakfast, but the meats and cheeses made me rethink the possibilities. We started with some orange juice and my wife had a coffee. While we sipped our beverages, we ran up and down the list of foods, unable to finalize our selections before the waitress returned for our food orders. Upon a second return to our table by the waitress and bunch of inner turmoil, we decided on some items. My wife asked for the Fruit and Yogurt along with the sweetbread special of the day. I chose the Antipasti Platter as a solution to my sudden meat and cheese craving and opted for the Breezy Hill Farm Pork Hash as the breakfast portion of my meal. The waitress asked for my toast order which she said came with the hash. Moments after ordering sourdough, she returned to tell me it didn’t come with the meal. I decided against the toast order as I had already ordered a lot of food. Our first foods – the fruit platter and my antipasti – came out at the same time. My wife had asked for both her items together, but the sweetbread took a little longer. Both looked great. She liked hers and I was intrigued by mine. There were a lot of items on my plate which I should have expected for the price, but there even appeared to be some that were hidden below others. There were about three meats, three cheeses, three vegetables, and a couple pieces of crunchy bread. I’m pretty sure it included prosciutto, salami, roasted peppers, olives – at least 3 types, and maybe Gouda, cheddar, both, or neither. There were others, but the waitress wasn’t sure what they all were, and quite frankly, neither was I even after eating them. It didn’t come as a shock that the antipasti platter was absolutely outstanding and definitely a “man food”. I was very pleased with the selection of foods on the plate as I am a big fan of variety. Every individual item was very tasty. The only minor critique would have been that it didn’t have enough bread as I liked making a tiny open-faced sandwich on them with a meat, cheese, and veggie. Mrs. Portlandeater’s sweetbread came to the table and was finished it before my hash showed up. I really like trying different types of hash around town which is why I ordered it, but I wasn’t overly enthusiastic about the rest of the plate which included polenta and poached eggs along with some parmesan cheese. I could have ordered just a side of the hash, but that seemed like disservice to my loyal readers. My hash arrived in a bowl, and truth be told, there’s something special about eating from a bowl. Everything can be eaten from a bowl – donuts, soup, pasta, or even cake. There’s less chance of a spill and it’s tougher for people to reach over and grab something from your bowl with their grubby, little hands. So we started off on the right foot. The hash was excellent – circular like it had been cooked in an egg ring and crispy as I like it. The poached eggs weren’t all bad considering I normally don’t eat poached eggs. The polenta seemed fine, though again, I’m not a polenta eater normally. I’d say if you were a polenta and poached egg eater that the plate would be an excellent choice. My wife and I were happy and full. The meal came to just over $50. It was a seriously pricey breakfast, but a strong offering from the Corner Room and the least I could give my readers upon my return. 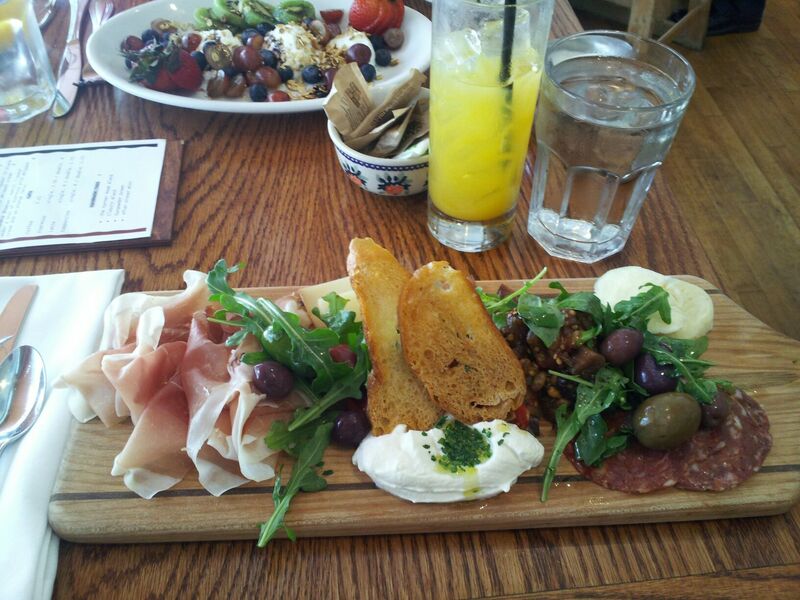 If you go for brunch, save up your sheckles and get the antipasti. Oh, and tell ’em Peterpeterportlandeater sent ya. I’m back, baby. Life is good, the Maine summer is upon us, and there’s no place I’d rather be eating than Portland. This entry was posted in Portland, ME food on June 18, 2013 by peterpeterportlandeater.